This posts describes how to fix the wifi networking problem on the Samsung XE700T1C Tablet PC. My new Samsung ATIV XE700T1C-A04US worked great until the Samsung update utility installed a new driver for the Intel WiFi device. After this update, the WiFi network would lose connectivity and then completely disconnect. The problem is not with my wifi network, as it is used by many other tablet, laptop and smartphones in my house. It was used reliably by the Samsung tablet until the wifi update. Samsung's technical support is unable to provide a solution. Their support staff is friendly but inept. The tech support article they sent me assumes that the problem is with me or my network. The only workaround I was able to identify was to rollback the WiFi driver to the original version that came installed with the tablet. Open Device Manager and locate the Network Adapters group. In my case, this is the Intel Centrino Advanced N-6235 device. 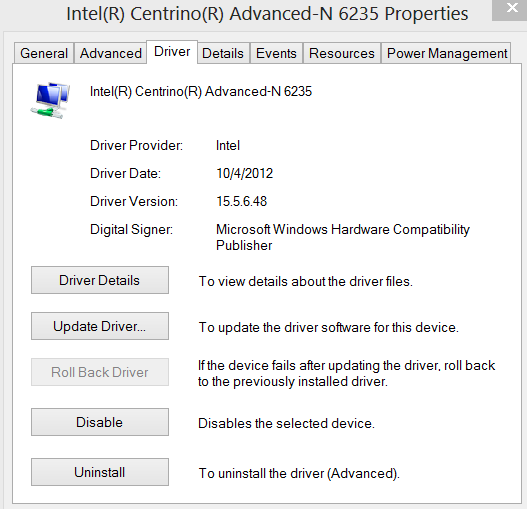 On the "Driver" tab, select "Roll Back Driver". The driver version that provides stable wifi connections for my tablet is shown in the screenshot below. Any idea where I can get that driver?